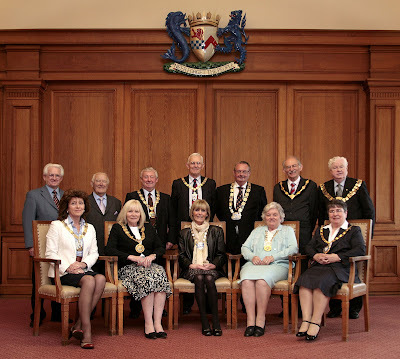 South Ayrshire Provost Winifred Sloan has hosted the annual meeting of the Scottish Provosts’ Association, the umbrella group for all 32 Provosts across Scotland. The Scottish Provosts’ Association represents the interests of all Provosts in their capacity of Civic Heads of local government, and a key part of the meeting held in Ayr was to explore ways to improve the services and support offered to Provosts, as well as establishing an agreed framework for their roles. It was attended by Provosts from East and North Ayrshire, Argyll and Bute, East Dumbarton, Shetland, Scottish Borders, West Lothian, North Lanarkshire and Fife. Opening the meeting, President William Petrie, Provost of Argyll and Bute said: “On behalf of the Scottish Provosts’ Association, I would like to express my thanks to Provost Sloan and her team for the very warm welcome we have received today. Provost Sheena Richardson, Secretary of the Association said: “We were delighted by the welcome and hospitality given to us by South Ayrshire Council and Provost Sloan. “Provosts in Scotland are dealing with changing and often challenging times, and the meeting helped us clarify some of the issues we face. The importance of the meeting was underlined by Provost Alex Cluness, who came all the way from Shetland, a distance of some 500 miles. Provost Sloan concluded: “It was a privilege to host the Scottish Provosts’ Association, and I hope all our guests had an enjoyable time in Ayr. Provosts have the same responsibilities as other elected members to hold surgeries and attend meetings. “We also chair the full Council meeting and act as the Council’s civic head at ceremonial, formal and other important occasions, promoting the values and enhancing the reputations of the councils we serve. “As nice as it is to network, I’m particularly pleased we were able to make real progress in defining some of the issues and difficulties Provosts face in current times, and I look forward to attending the next meeting to take these developments forward.